Awareness about healthy living continues to grow. But even with increased knowledge and our best intentions, it can still be difficult to get all the nutrients we need. When taken together, the three components of the dōTERRA Lifelong Vitality Pack are a comprehensive daily nutritional supplement that give our bodies an extra boost. The doTERRA Lifelong Vitality Program makes taking the first step on the path toward a lifetime of vitality and wellness convenient and affordable. Our lifelong health and vitality depend on many factors including diet, physical activity, weight management, rest, stress management, exposure to toxins, and inherited genetic predisposition for disease or wellness. While some of these variables are beyond our complete control, breakthrough scientific research is revealing many ways we can influence—and even control—significant factors of aging and wellness. A long life full of vitality and healthy aging begins with providing your cells with essential nutrients and metabolic factors to help them perform optimally. Save $74.00 when you buy these three products together in this convenient pack! While it is abundantly clear that diets in the United States and in many developed countries include adequate and even an overabundance of calories, a growing body of evidence shows that even as we eat more, we are obtaining less of the essential nutrients vital for optimal health. Over-processed, calorie-rich, nutrient-poor food choices threaten to make us fat even as our bodies are deprived of vitamins, minerals, and other essential nutrients. The American Medical Association acknowledges the prudence of taking nutritional supplements, admitting that while “the clinical syndromes of vitamin deficiencies are unusual in Western societies, suboptimal vitamin status is not” (Journal of the American Medical Association, June 19, 2002). Most of the vitamins and minerals absorbed in our bodies come from the food we eat. Sometimes vitamins and minerals are isolated or synthetically constructed and may become more difficult for our bodies to recognize and absorb as food nutrients. The vitamins in Microplex VMz are presented in a patented glycoprotein matrix to help promote bioavailability. To make a vitamin glycoprotein compound, a vitamin is introduced to a culture of lactobacillus and yeast. As it grows, the yeast metabolizes and binds the vitamin into its protein matrix, making the vitamin more recognizable as food in the digestive process. The food-derived minerals in Microplex VMz are similarly cultured in yeast to promote bioavailability. 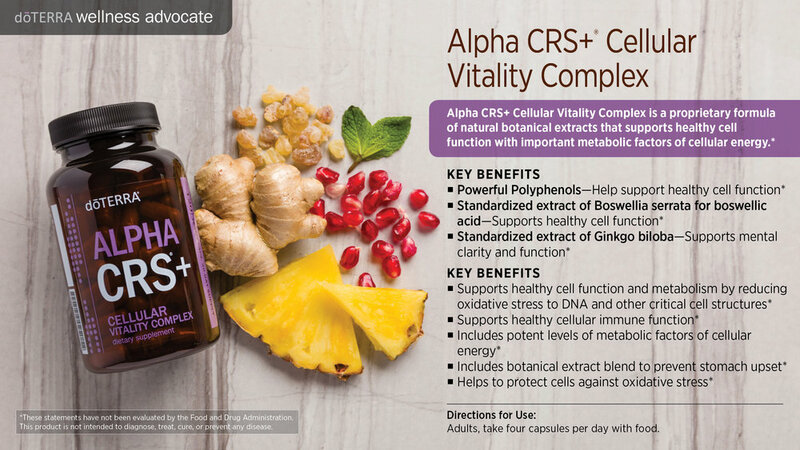 Microplex VMz is formulated to be used daily with doTERRA Alpha CRS+® and xEO Mega® as a comprehensive dietary supplement foundation for a lifetime of vitality and wellness. Essential Fatty Acids (EFAs) are nutrients required for many key functions in the human body, including cell growth, brain development, muscle activity, immune function, joint health, and many others. * While some fatty acids can be produced inside the body, “essential” fatty acids cannot be produced by our bodies; therefore, we rely on the food we eat to supply these important nutrients. The most common of the essential fatty acids are omega-6 and omega-3 fatty acids. Modern science suggests that for optimal health, humans should consume a one-to-one ratio of omega-6 to omega-3 essential fatty acids. Unfortunately, due to the abundance of omega-6 fatty acids in vegetable oils and our increasing consumption of fried and fatty foods, a typical Western diet includes omega-6 fatty acids in a ratio as high as 20 to 1! While our diets must include some omega-6 fatty acids as essential nutrients for life, the disproportionate consumption of omega-6 fatty acids and other unhealthy hydrogenated or trans fats has been linked to poor health. Studies also link low intake of omega-3 fatty acids to reduced mood and cognitive function. Restoring the balance between omega-3 and omega-6 fatty acids is an important step in keeping your body healthy. This can be done by decreasing your intake of unhealthy foods high in omega-6 fatty acids and increasing your intake of foods that are rich in omega-3 fatty acids. Fish is an excellent source of dietary omega-3 fatty acids, but omega-3s can also be found in canola oil and the oils of some nuts and seeds. Because of growing anxiety over the levels of toxins and heavy metals present in the world’s oceans, daily fish consumption as a source of omega-3 fatty acids is not acceptable to some consumers. In fact, many nutritional experts warn against frequent fish consumption to prevent exposure to these toxic pollutants. One serving of xEO Mega® provides 900 milligrams of pure, micro-filtered marine lipids with 300 mg of EPA, 300 mg of DHA, and 70 mg of other omega- 3s. Added to this is 200 mg of plant-based, omega-3 rich, Echium seed oil, along with 50 mg of pomegranate seed oil. xEO Mega also contains a proprietary blend of doTERRA CPTG Certified Pure Therapeutic Grade essential oils that work in harmony with the omega-3 fatty acids in xEO Mega. Clove oil and the constituent thymol in Thyme oil are powerful antioxidants that work to enhance the overall efficacy of xEO Mega by delivering protection against oxidation. * The essential oil blend also supports healthy cellular response to oxidative stress and healthy immune function and has digestive calming effects,* which makes taking xEO Mega as pleasant as it is healthful. The essential oils in xEO Mega also function as a natural preservative system that protects the omega-3 fatty acids and lipid-soluble vitamins from oxidizing and going rancid. doTERRA uses the best quality marine omega-3 oils in the world. Both oils are from top Norwegian manufacturers, every single batch is tested for over 250 contaminants, and both oils are certified sustainable by the prestigious Friend of the Sea organization in Europe. xEO Mega is a revolutionary approach to supplementing our diets with omega-3 fatty acids and other fat-soluble nutrients that help support circulatory health, brain health* and optimal immune function among many other systemic benefits. * This unique formula of lipid-soluble nutrients is packaged in small, vegetarian-friendly softgels. xEO Mega is formulated to be used daily with Microplex VMz® as a comprehensive dietary supplement foundation for a lifetime of vitality and wellness. Cells are the basic building blocks of all life. Healthy tissues, organs, and, ultimately, healthy organisms depend on cellular reproduction and specialized function, energy production, and timely cell death when cells are not functioning at optimal levels. As we age, cellular function can deteriorate and we gradually begin to experience decreased energy and performance. DNA also regulates the proliferation of mitochondria in cells. Mitochondria are cellular structures in which oxygen and food nutrients are metabolized to create energy for life. Healthy mitochondria function like well-tuned engines, producing efficient power with less exhaust (metabolic waste). As we age, the number and efficiency of cellular mitochondria can decrease, resulting in decreased energy and performance. Unhealthy mitochondria also put out more toxic exhaust in the form of free-radical molecules that can damage cellular DNA, setting off a cascading oxidative chain reaction that can damage critical cell structures and disrupt healthy cell function. Free-radical molecules are unstable molecules with one or more unpaired electrons. When free-radical molecules come in contact with stable molecules, they steal electrons from them turning stable molecules into unstable free-radical molecules that, in turn, steal electrons from other stable molecules. This cascading process of free-radical damage is called oxidation. Free-radical damage to cells can come from external and internal sources, but the primary free-radical or oxidative stress to cellular DNA comes from cellular metabolism of energy. When cellular DNA and other critical cell structures are damaged by free-radical molecules, cells do not function optimally. Left unchecked, exposure to high levels of free radicals can leave the body more vulnerable to the oxidative damage of free radical molecules. Lowering oxidative stress in cells can help maintain healthy cellular function. Certain food nutrients also have been demonstrated to help the body recover from occasional high exposure to free radicals.